Man Ray re-created this work multiple times after making the original. The piece was first intended as a silent witness in Ray's studio - watching him paint. In the second version, which was published in the avant-garde journal This Quarter, in 1932, Ray substituted the eye of Lee Miller, his former lover, after she left him and married a successful Egyptian businessman. He wanted to attack Miller by "breaking her up" in his works that feature her, and thus this second version, called Object of Destruction, was accompanied by the following instructions: "Cut out the eye from a photograph of one who has been loved but is seen no more. 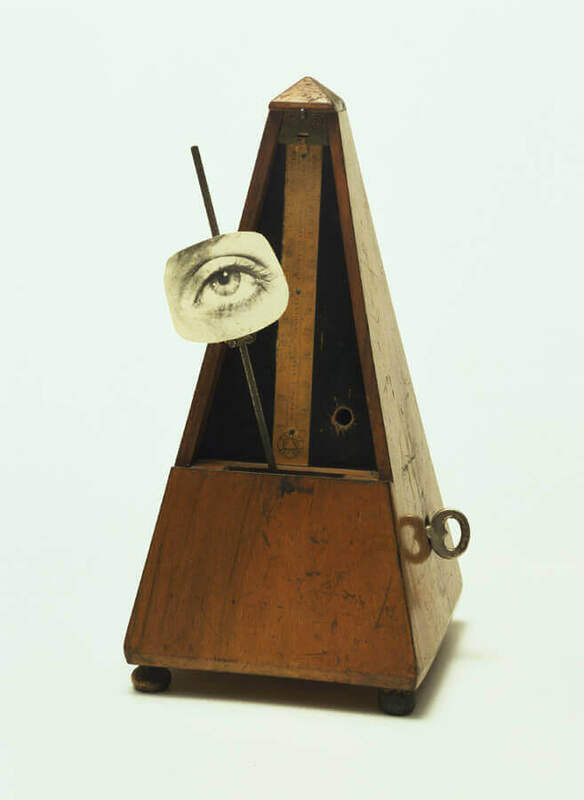 Attach the eye to the pendulum of a metronome and regulate the weight to suit the tempo desired. Keep going to the limit of endurance. With a hammer well-aimed, try to destroy the whole at a single blow." At an exhibition in 1957, a group of students followed the instructions and destroyed the object. It was later reconstructed and made into multiples using the money Man Ray received from the insurance. He renamed the work Indestructible Object.